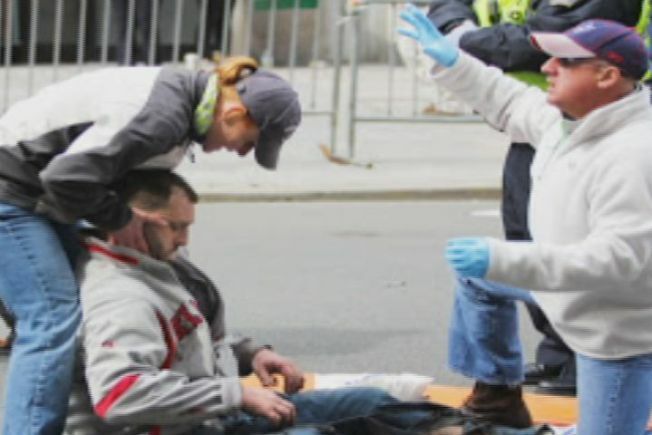 As many people ran away from the bombs near the finish line of the Boston Marathon om April, two Connecticut officers ran toward them and rescued one of the many victims. Montville officer Karen Moorehead and State Trooper Jeff Meninno had just arrived near the finish line after watching the Red Sox game at Fenway Park that Monday. Standing across the street from the Forum restaurant, they were only yards from site the second blast. Once the smoke cleared, Moorehead noticed a man on fire walking in the middle of the street. The two sprang into action., jumped the barrier and identified themselves to Boston police as fellow law enforcement. At first, all they knew was the man was named Jarrod. They began talking to him about everything from his friends to the Patriots. Meninno even promising to bring him to a game next season. Just moments prior to the blast, Clowery was enjoying the race in front of the Forum restaurant with eight friends. In a picture, you can see them and just to their left, the suspected bomber, wearing the white hat. Five of Clowery’s friends were severely injured. While a picture of Moorehead and Meninno helping Clowery has become famous, he was not the only person they helped that day. They stayed with Clowery until the ambulance got there. They next saw him on the news when he was released from the hospital last week. While they have not met yet, Moorehead did speak with him on the phone. “He was so upbeat. He was just talking about what he remembered. He said, ‘I don’t really know you girl, but I love ya,” Moorehead said. Meninno said the two just did what they were trained to do. “I don’t think we did anything heroic. We were just there. Jarrod was on fire. People were hurt that needed help. I was able to provide it,” he said.